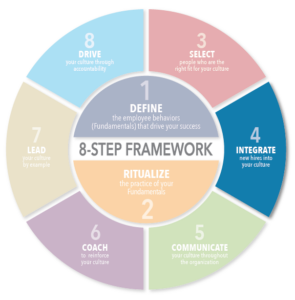 As most readers know, we use the 8-step framework as a way to organize the steps necessary to intentionally create, drive, and sustain a high performing culture. In the next two posts, I’d like to explore the fourth of those steps – – integration. 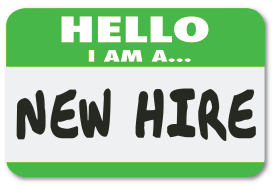 Integration is the word we use for what some companies call “orientation” or others call “on-boarding.” It describes the process by which you take a new recruit and bring them into your company. I prefer to use the word “integration” because it implies that you’re assimilating the new person or making them an integral part of your organization. Regardless of the word you choose, how you do this process has an enormous influence on your culture. Given the importance of those early impressions, it’s amazing to me how few companies give the integration enough attention. They spend tens of thousands of dollars in the recruiting process, but then start people so poorly that it’s like digging a hole for them to climb out of, instead of starting them on a ramp to superstardom. Picture that new employee spending most of the first day filling out new hire paperwork and benefit enrollment forms, feeling lost, and trying to figure out how things work. What kind of impression are we creating? As you consider the time and effort you’re willing to devote to a first-class integration process, it’s important to consider this from a long-term perspective. Let me show you want I mean: Let’s suppose your integration process was one-week long. If you look at this from the perspective of a month, you’d feel like you wasted 25% of the available productive time of this new employee. However, looked at from the perspective of one year, it’s less than 2% of their productive time, and looked at from a five or ten-year vantage point, the lost productivity of that first week is so small as to be inconsequential. And yet, doing the first week effectively will impact the rest of this new person’s career. As important as integration is, there are always real world business challenges that tempt us to compromise on the process. We’re busy, we’re short-staffed, we’re overwhelmed, and so despite having designed a great process, we can sometimes be tempted to shortchange that process in the interest of expediency. It takes tremendous leadership discipline to avoid this trap and to stay true to the process. Remember: you have only one chance to create a great first impression. Don’t compromise. In my next blog post, I’ll share some tips on how to create a world-class integration program and explain what elements every integration program should include. In the meantime, if you’d like to know more about this or any of the other steps in our 8-step framework, just shoot us an e-mail or give us a call.